A newspaper ad can be a rickety thing on which to build a persona when it’s not a runaway ad. Those will give you what the person is wearing, who is advertising for them, and sometimes the skills they have. To better understand Elizabeth Weed, I turned to genealogical and contextual research. George Weed’s estate was settled by Elijah Weed, his son by his first wife, Esther. Altogether, it was worth £1268.19.7, a considerable sum in 1777. Granted, £775 was book debt, but that cash could be called in. The remainder consisted of £132.15.2 in Medicines etc.,£100 cash, and £261.3.9 in Goods and Chattels. Of this estate, widow Elizabeth kept £55.8.3 in Goods and Chattels, all of the Medicines etc. and £50 in cash. That’s all of the medicines, 20% of the value of the “Goods and Chattels,” and half the liquid cash of the estate. This would certainly provide the supplies and capital necessary to continue the pharmacy business. Morris, Margaret Hill, 1737?-1816., Margaret Morris / Morris Smith, pinx’t ; eng. by J.M. Butler. Library Company of Philadelphia. But what was life like as a woman in business? How many women were in business in Philadelphia in the last quarter of the 18th century? More than you would think– mostly as shopkeepers selling dry goods, some as tavern keepers, and others as nurses, midwives, and healers, including women acting as pharmacists and “doctresses.” Patricia Cleary’s article “‘She Will Be in the Shop’: Women’s Sphere of Trade in Eighteenth-Century Philadelphia and New York” published in the Pennsylvania Magazine of History & Biography Vol.CXIX,No. 3 (July 1995) was particularly helpful in understanding women in trade. Brandt’s article raised helpful questions to ponder: would Elizabeth Weed have taken food and firewood in barter for medicines? During the Occupation of Philadelphia, food was scarce and exorbitantly priced, and she was feeding not just herself but also her son George, born in 1774. How difficult was it to obtain medicinal supplies when the harbor remained closed (in part because of chevaux des frises built by Thomas Nevell)? When patriots fled the city ahead of the British, did Weed’s trade suffer? Did she conduct business with the British, and how did her friends and neighbors react if she did? Only some of those questions can ever be answered. For the rest– about Weed’s particular business– we can only make inferences based on other accounts. Occupied Philadelphia at the MoAR is one of my favorite events. It’s not too far, in an urban setting, and makes visible the history of the Revolution that’s hard to get at, the history of everyday people. Last year, I portrayed a follower of the 17th Regiment of Foot and a petty thief; this year, I wanted to do portray a woman in business. I’d settled on a milliner because that’s a trade I know well enough to portray–though I could not find documentary evidence of women in the millinery trade during the early months of the Occupation, nor could I satisfactorily justify selling hats, bonnets, and jewelry to a population facing inflation and food shortages. Happily, just two weeks before we’d have to pack the car, the program manager posted exactly what I needed, but had missed by not looking late enough into October: an ad placed by a woman in business. Advertisement placed by Elizabeth Weed, Pennsylvania Evening Post, Thursday, October 23, 1777. This is what I’m always looking for: someone to be, a solid place to start the research that takes me from the general to the specific. Who was Elizabeth Weed? She was only a little tricky to find. Records documenting Elizabeth Delaplaine Dickinson Weed Nevell are scarce. Based on the date of her first marriage, to William Dickinson, in 1755, she was probably born between 1730 and 1735, making her about 44 to 47 in 1777. She was widowed by 1768, the year she married George Weed, who had lately been the superintendent of the Pennsylvania Hospital until 1767, and was then a practicing pharmacist. Weed, born in 1714, had studied and practiced medicine in Connecticut and “West New Jersey” before moving to Philadelphia around 1760. After his death on February 1, 1777, Elizabeth Weed prepared and sold the medicines George Weed taught her to prepare, and, presumably, to dispense. Portraying a widow six months after the death of her husband seemed plausible: I have a grey wool tabby gown (with a Fort Ticonderoga white wash stain) that seemed reasonable enough for “second mourning”– until I discovered that Elizabeth Weed had purchased a house for £600 just before she married her third husband, Thomas Nevell. 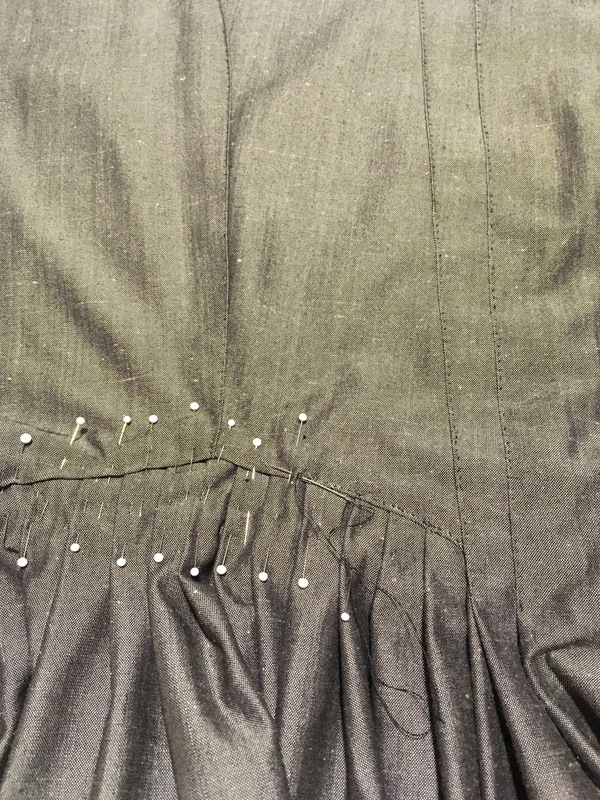 A widow of means was going to require a new gown and accessories in addition to the materials of her trade– two research rabbit holes at once (plus Thomas Nevell, since he provided Drunk Tailor with an ideal role for the weekend). Period prints provided some guidance, and since widows took up the trade of ‘doctress’ often enough, some provided a glimpse not only of clothing, but also of the material culture of 18th century pharmaceutical practice. Fortunately, I had a gown-length remnant of black and white silk in the strategic fabric reserve, as well as a remnant of black silk for a mantelet. When she married George Weed, Elizabeth had already lost one husband, so an English gown with robings seemed a reasonable choice. Mrs. Thomas Mifflin’s grey silk gown lurked in my memory as inspiration (or justification) for the style of gown, though not for the meaning. In many ways, the material trappings of widowhood were the easiest part of this project. I’d done some research on late colonial and early Federal mourning customs in a previous life, and had a sense of what was expected of bereaved widows in the 18th century. Clothing and accessories would signal status, and guide the behaviour of others towards me (in this case, keeping Thomas Nevell at a respectable distance). I could have chosen a gown already in my wardrobe (grey wool, green wool, blue wool) but inhabiting the world of the widow from the skin was important to me as a means of fleshing out a real person for whom I had scant information. Mark Rothko: another suicidal abstract bad-boy painter from the middle of the last century, so what? This is what: a day at the museum when then the last painting in the Napoleon exhibit is presented in such a way that it was, in effect, the same as the last painting I happened to see. Rothko wasn’t one of my top-ten favorite artists, but he was the top of the list of color-field painters I liked when I was studying art. He’s the kind of artist who grows on you as you mature, the way eating habits change with experience. The article I’m reading now compares his work to Roman villa murals, and that makes sense when you encounter his work. It’s color and not color, depth and surface, immersive. Simply immersive. Rothko creates a world that exists within your own head; his paintings invite you into his mind, which then occupies yours. 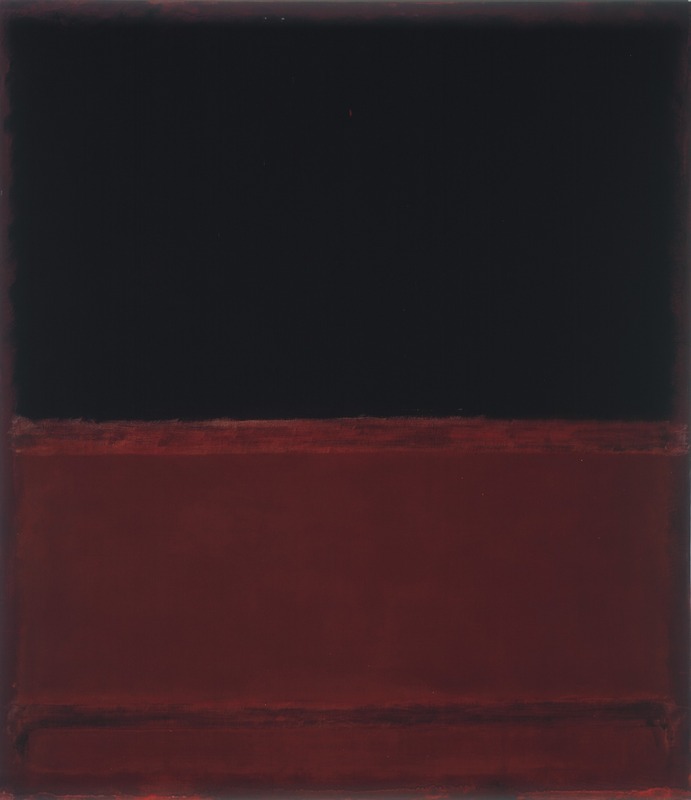 It’s not always comfortable, given Rothko’s own dark visions. It remarkably effective in its apparent simplicity, the colors hovering over one another, creating depth with saturated color. 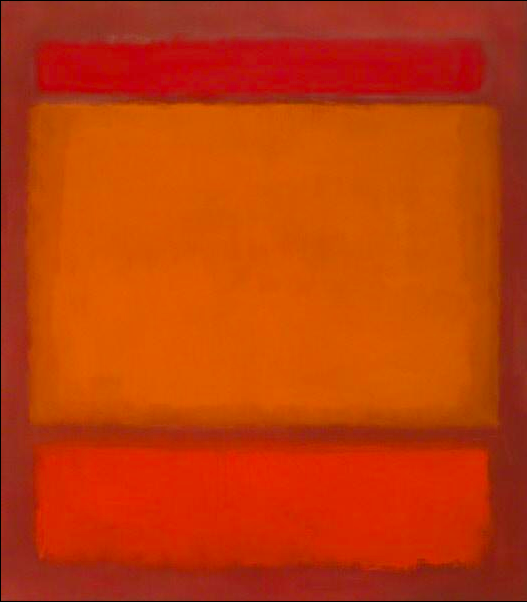 The first Rothko I saw must have been in Chicago, though the first one I remember is Red, Orange, Orange on Red in St. Louis; I must have seen the Albright Knox’s not long after they acquired it– the red and black are more familiar and more comfortable, in a way, than the orange and red. Just as the projected waves washed the walls of the final gallery in the Napoleon exhibit, so too did the blues of this untitled painting move. They vibrated with emotion, and I was immersed in blue, a kind a symphony of color, as close as I will ever come to synesthesia. And that’s what good exhibits do, what good history does, what accuracy does. It renders the past visible, tactile, sensible, immersive. It catches us, and we fall down. Art, history, culture: if we are sucked into that otherness, hooked by feeling, we are more likely to learn something. As stood before the Rothko, I noticed a Cornell– and a teenager noticing the Cornell. 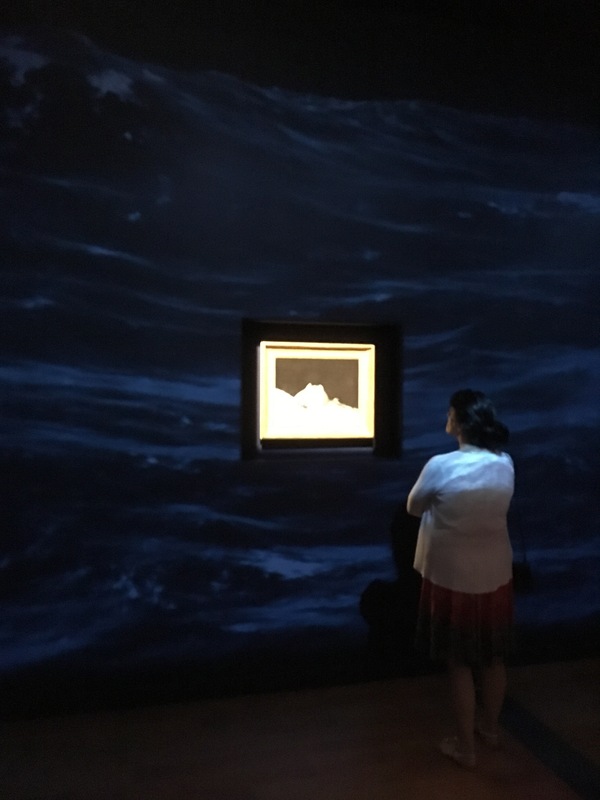 Joseph Cornell’s boxes were my first obsession, when I skipped school to go to the Art Institute of Chicago to spend my day surrounded by Cornell’s tiny universes, transported to another place. Isn’t that what we’re trying to do, every time we dress in these funny clothes, visit historic sites, reenact the past? Aren’t we all seeking some sublime moment, when this solid present becomes the ether of the past? 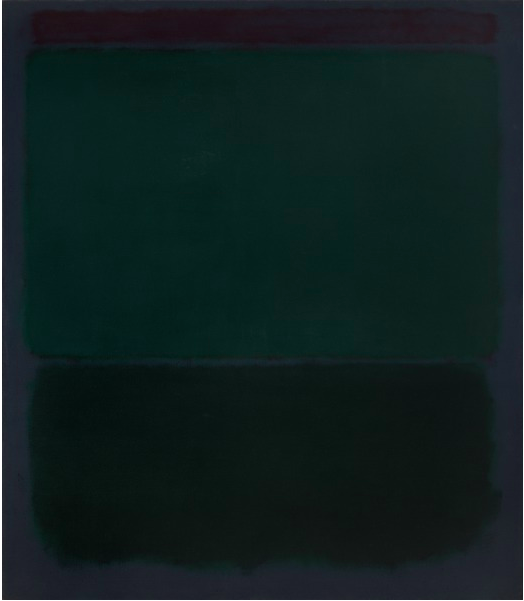 Sometimes the way to understand that most readily is to study something else entirely– like a Rothko. Or a Cornell. Sometimes the way into a thing is sideways, when understanding and inspiration come from an unfamiliar place, when me make connections we don’t expect. L’Empereur Napoléon Ier sur son lit de mort, oil on panel by Denzil O. Ibbetson, 1821. Death and Napoleon and Rothko and Cornell all seem obviously connected to me– and not just through the symbolism of the rich cobalt blues. *I do this in museums: when I walked into the Kaufman Gallery at the NGA, tears welled in my eyes at the sight of so much beauty. Unlike some of my earlier posts, this Black and Blue refers to a different kind of historical effect: the purely aesthetic. (Yes, it is a departure for me. Moving below the Mason-Dixon line has been curious, as my encounters at the bank regularly make me wonder if I have stumbled into the Invasion of the Body Snatchers or Pleasantville. Surely real humans aren’t this nice! I thought the people of Rhode Island were just fine, but maybe my standards were warped by growing up in a Major Midwestern City.) In any case, times change and so do people. Onward, to the aesthetic! First, there was the new waistcoat. That should be enough to refresh an outfit, right? The set of the armscye didn’t coordinate with the white gown I made two summers ago, so a new item would be in order. 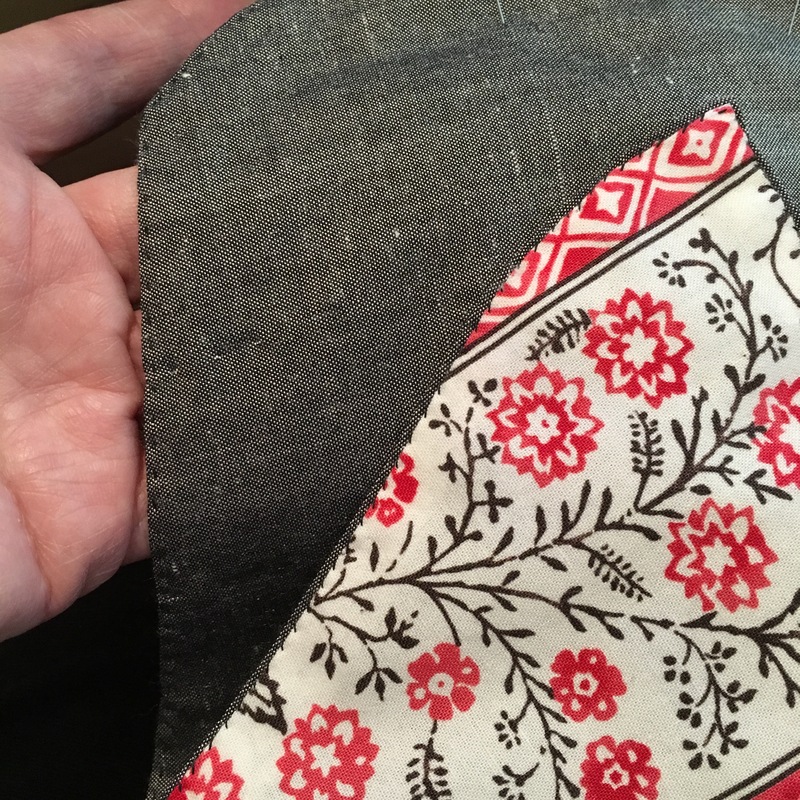 I thought this would be the case in the muslin, but when I basted up the blue silk (selected because I had enough material to make a waistcoat and a cap), it was clear something new would have to go underneath. The original waistcoat’s date of ca. 1797 helped narrow down my choices, and a 1799 fashion plate helped as well. Blue over white: pretty snazzy. I sketched up the plan for the white wrap-front gown, re-imagined that when I got batiste after asking for voile, and figured I’d be fine. A blue silk cap trimmed in black wool lace or gold silk cord still seemed like a good solution. But the fashion plate showed a black hat or bonnet, and whilst trolling Etsy with a Manhattan in hand, searching for an 1830s-appropriate buckle, I took a look at one of my favorite shops, just to see. The “overly honest milliner” confessed that this style would not flatter everyone. Challenge accepted! In truth, though, I have a small head, and having cut my hair short for the summer, can (must) wear a slightly different kind of headware. I’ve also tried on enough of Anna’s millinery to know what will and won’t work for me, so I was pretty certain this bonnet would suit me well. I trimmed it with some blue silk double-faced satin ribbon recovered from a failed bonnet attempt of several years ago, and then cast about for something else. Something different. Wednesday found me steaming feathers– as you do– while Drunk Tailor pulled KP duty. I hid the feather quills (more or less) with a ribbon rosette, and the considered fastening. Many early-nineteenth century bonnets don’t tie under the chin, and in any case, I didn’t have enough ribbon left to pull that off. Parking lot selfie, with sweat, curls, and feathers. I like the way the feathers contrast with the curls. The solution? Another rosette. On the feather side, I stitched the straight tail of the ribbon to the bonnet. The second rosette attached to the ribbon, which I then ran under my chin and pinned. Bonnet secured, more or less, though the feathers necessitate caution when exiting a vehicle. 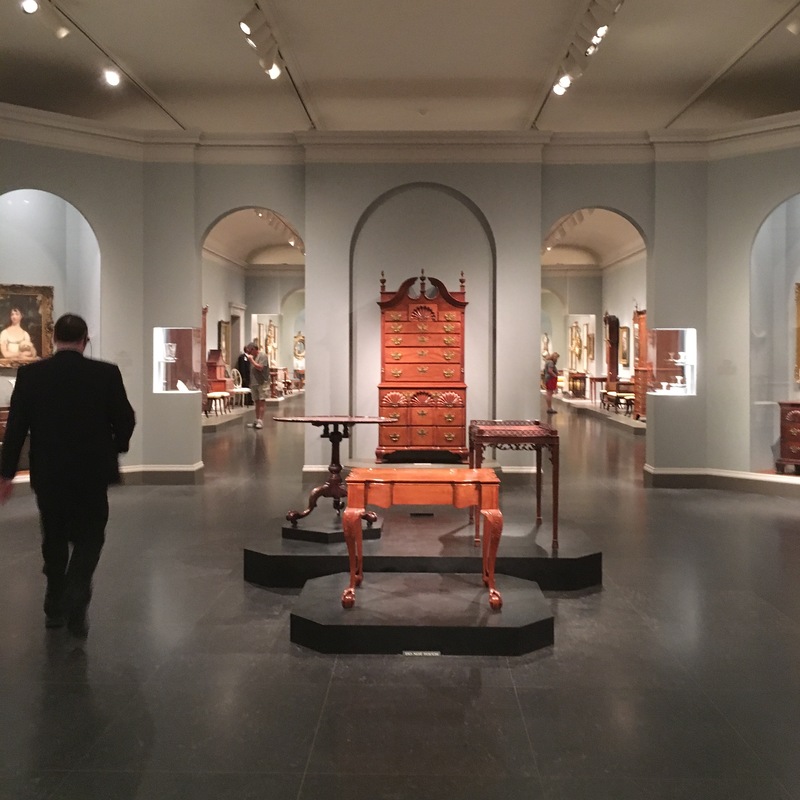 The idea of visiting a museum in costume is incredibly appealing, and all the more so when you can visit galleries of objects from the time period your costume replicates. Add to that the layer of traveling on the weekend in the clothes from the time when tourism first became a “thing” (at least among the monied classes), and you have a recipe for an excellent adventure. If you are going to play the tourist, especially if you are visiting the “spoils” of the former emperor, you have to dress appropriately. American tourists today may travel in camo crocs and backwards baseball caps, but people in the past dressed for touring and it seemed appropriate to dress for this trip. This trip, with the fun of visiting in period clothes, reminds me of the books still in storage, and the books I have yet to read — one on early country house tourism— that document the changes in how people spent their time and consumed goods, and the reasonably concurrent rise of both the museum and the department store. Raptures about the mounting, I think, but we might as well we shopping. Peale and Zola have more in common than you might think, or at least Mr. Peale and Mr. Selfridge. These compendia of material goods are similarly structured — both organized around themes or types, whether ladies’ lingerie or Oceanic art– and have similar aims of edification and [cultural] consumption. When your hat sees its cousin in a case…. All in all, an excellent trip, with much to see and talk about. After finishing our tour of the Napoleon exhibit, we lunched (another experience similar to the department store) and toured more of the museum, and had a day well spent.